Remtin: Each film coated tablet contains Memantine Hydrochloride 5 mg.
Memantine Hydrochloride is a low affinity, voltage dependent, uncompetitive NMDA (N-methyl-D-aspartate) receptor antagonist. Persistant activation of NMDA receptors in central nervous system by the excitatory amino acid glutamate contributes to the symptomatology of Alzheimar’s disease. Memantine exert its therapeutic effect through its action as a low to moderate affinity uncompetitive NMDA receptor antagonist and binds preferentially to the NMDA receptor-operated cation channels. 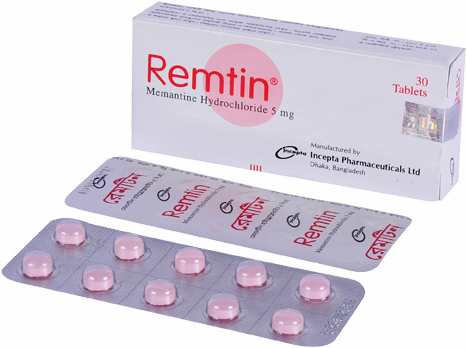 Remtin (Memantine Hydrochloride) is indicated for the treatment of moderate to severe dementia of the Alzheimar’s type. Remtin can be taken with or without food. In case of renal impairment: A target dose of 5 mg BID is recommended in patients with severe renal impairment (creatinine clearance: 5-29 ml/min). In case of hepatic impairment: No dosage adjustment is needed in patients with mild or moderate hepatic impairment. Remtin should be administered with caution to patients with severe hepatic impairment. The most common side effects (frequency 2% and less) are hallucinations, confusion, dizziness, headache and tiredness. Uncommon side effects are anxiety, hypertonia (increased muscle tone), vomiting, bladder infections and increased sexual drive.In case of epileptic seizure patients, Remtin may increase the chances of at least one occurring. Remtin has not been systematically evaluated in patients with seizure disorder. Conditions that raise urine pH may decrese the urinary elimination of Memantine resulting in increased plasma levels of Memantine. There is no evidence of carcinogenesis, mutagenesis and impairment of fertility. Nursing mothers:It is not known whether Memantine is excreted in human milk and therefore caution should be exercised when Memantine is administered to a nursing mother.